"Glory Be to God for Keeping Us Fine until This Time"
Beyond the fact that the Ethiopian Orthodox Tewahedo Church is ancient, historical and national church, it is also considered as the second church on earth next to the church of Jerusalem. 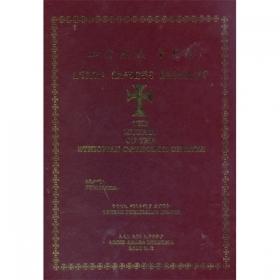 And then, since the time in which the Ethiopian Orthodox Tewahedo Church came to existence, one of the Holy Scriptures that the Church uses for doctrinal teaching, for prayers, and for God's worship is the book which comprises the 14 Ethiopian Anaphora. In its implementation, the Anaphora can be divided into three services. The 14 Ethiopian Anaphoras are the following. Nevertheless, since the time of the establishment of the Ethiopian Orthodox Tewahedo Church until now, using the 14.Anaphora and the Eucharistic Liturgy mentioned above, the Holy Spirit through the church makes the bread and the wine into the true body and blood of the son of God Jesus Christ, and is making the people united with God. It will also continue until the end of the world to use the Anaphora for such service. translate the Anaphora to Amharic language in the past several years in order to invite people to participate in the prayer. Moreover, as our church is now becoming a worldwide church and the number of its followers is increasing tremendously, it is really up to the church to have a liturgical service written or translated in different languages such as Ge'ez, Amharic, and English language. We praise and glorify God for helping us to do so in our publication process.